As part of the state’s rigorous educational standards, it requires anyone who wants to teach science at the fourth through eighth grade levels to pass the Texas Examinations of Educator Standards (TExES) Science 4-8 Exam before they can become certified to teach. The test measures a combination of the candidate’s knowledge of science and their ability to develop and apply effective teaching methods to pass that knowledge onto their students. How Do I Register for the TExES Science 4-8? Before you can register, you will first need to be approved to take the test. In order to do that you need to meet certain educational and training criteria including holding at least a BA degree in a relevant field of science and proof that you have completed an approved educator preparation program. Once you have been given your approval to test, you can register online, by phone, or by mail. The exam is offered continuously throughout the year and you can register up to two days before the test so you have quite a bit of flexibility. However, it’s advisable to register as far in advance as possible in order to reserve the date and time most convenient for you. How Should I Prepare for Test Day? There are two available testing sessions each day. One session begins in the morning and the second begins in the afternoon. Choose the one that is most convenient for your schedule and also take your personal strengths into consideration. If you are not really a morning person, for example, opt for the afternoon session so that you can be sure you will be fully rested and ready to sit for a lengthy exam on the day of the test. Your testing session will be five hours long so, in addition to making sure you are well rested, you also need to make sure that you have eaten a full, nutritious meal before your session. Something with a lot of protein is recommended as protein provides more sustained, long term energy. What Subjects Will Be Included in the Test? The first four content areas will measure your knowledge primarily of the scientific curriculum for grades four through eight but also more advanced scientific concepts since one needs a somewhat more advanced understanding of the science in order to effectively teach the fundamental concepts. The final content area will focus on methods and strategies for teaching science and test your knowledge of psychological and learning development of children within this age range. You should also note that of the 90 questions on the test, only 80 will count toward your final score. The other 10 are “trial” questions which are being considered for future versions of the test. However, since these unscored questions are dispersed throughout the exam and are not identified, it is best to just treat all 90 questions as if they count toward your score. The TExES Science 4-8 Exam is given a scaled score ranging from 100 to 300. You need to achieve a minimum score of 240 in order to pass. Your score report will include your total score for the entire exam as well as the results for each individual content area. This information will be very useful if you didn’t get the minimum score required and need to take the exam again. It will also be helpful in guiding you toward what you might want to spend a little more time studying before you begin teaching. Do I Need to Study Before Taking the TExES Science 4-8 Exam? Although you have likely seen all of this material in your classes, your success on this exam depends on your ability to recall that information quickly, apply it efficiently, and understand the best means of teaching it to students. 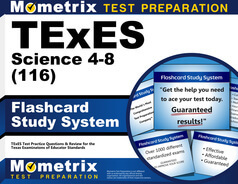 So in order to make sure you perform your best, use a combination of preparation methods including the TExES Science 4-8 Study Guide and TExES Science 4-8 Flashcards. The guide will be your one stop review of all four fields of science as well as the educational standards and methods. The overview was put together by a team of experts and written in clear, easy-to-follow language. The flashcards provide a more engaging means of reviewing the same essential material. They work perfectly with the guide to provide a well-rounded study plan that will help you not only refresh your memory of these essential concepts but also develop essential test taking skills like recall, analysis, and making educated guesses. Mometrix Academy is a completely free resource provided by Mometrix Test Preparation. If you find benefit from our efforts here, check out our premium quality TExES Science 4-8 study guide to take your studying to the next level. 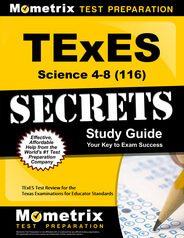 Just click the TExES Science 4-8 study guide link below. Your purchase also helps us make even more great, free content for test-takers.